Aggressive Personality: When Does it Develop and Why? Published in Virginia Counselors Journal 26, 67-76. 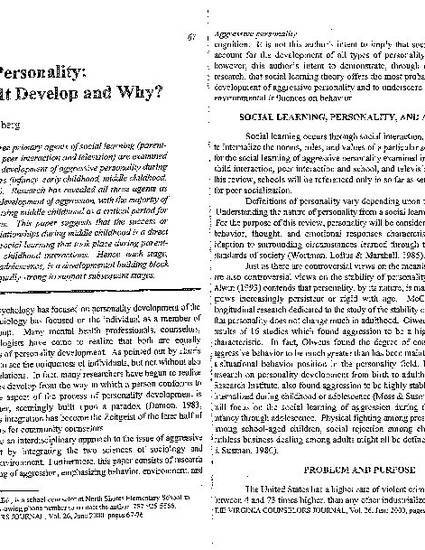 In this review, three primary agents of social learning (parent-child interaction, peer interaction and television) are examined in relation to the development of aggressive personality during the formative years (infancy, early childhood, middle childhood, and adolescence). Research has revealed all three agents as influential in the development of aggression, with the majority of research emphasizing middle childhood as a critical period for peer relationships. This paper suggests that the success or failure of peer relationships during middle childhood is a direct reflection of the social learning that took place during parent-infant and early childhood interactions. Hence, each stage, infancy through adolescence, is a developmental building block which must be equally strong to support subsequent stages.